Well, after less than an hour of debating on Monday night, Donald Trump just slipped up, majorly. When Democratic candidate, Hillary Clinton, asked Trump why he hasn't released his tax returns — something that all presidential candidates do — Trump said he would release his tax returns, but only if Clinton released her deleted emails. Okay, what's the big deal? Well, for months the GOP candidate has said that he cannot release his tax returns because he is under audit by the IRS — by suggesting that he would indeed release his tax returns (in return for Clinton's emails), Trump proved that there's absolutely nothing stopping him from doing so. Yes, The Donald just debunked his own excuse, and he did it during the presidential debate in front of millions of Americans. Now that it's clear that Trump could indeed release his tax returns, speculations will grow that the GOP candidate could be hiding something in his tax returns that he doesn't want the public to see before the election. According to The Washington Post, during the Monday night debate Clinton suggested that Trump doesn't pay any federal taxes, which would certainly not make the GOP candidate look good in front of the American public. So, what was Trump's retort to Clinton's accusation that he doesn't pay federal taxes? Believe it or not, Trump responded, "That makes me smart," which sure sounds like yet another tax return gaffe to me. If Trump releases his tax returns, voters will be able to see whether or not the candidate has donated any of his (supposedly) "huge" fortune to charity, which The Washington Post reports that, in fact, he has not. Furthermore, it's no secret that Americans want wealthy citizens to pay high tax rates — a recent Gallup poll reported that 61 percent of Americans think that wealthy citizens do not pay enough in taxes — and it certainly would not look good if a man as wealthy as Trump claims to be, avoids paying taxes. 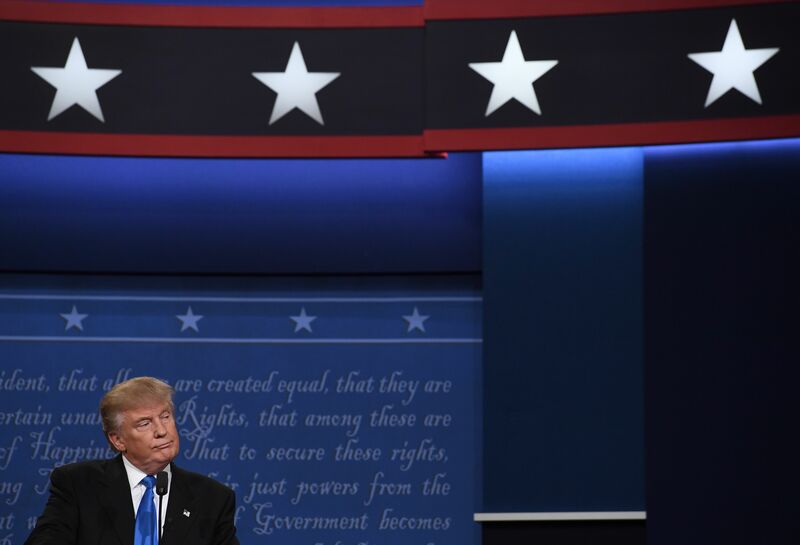 It's unclear whether Clinton will ever release her deleted emails, and therefore, Trump's suggestion that he would release his tax returns if Clinton publishes her emails, feels like an empty promise. Even though every presidential candidate for the last 40 years has released his or her tax returns (including Clinton, of course), it doesn't seem like Trump will follow suit, and now there's more reason than ever to be suspicious of his refusal to do so. The debates certainly are not off to a good start for the GOP nominee.